2003: The Long Branch Historical Museum Association has received a $342,410 grant from the New Jersey Historic Trust for the stabilization and the first phase of restoration of the building. A Stabilization project funded by this money was completed in 2003, saving the building from impending collapse. Additional funds for the restoration of the church bell and belfry were received from the Monmouth County Historical Commission. 2005: The Church of the Presidents has received a Save America’s Treasures Grant for $98,611. 2007: The Church has a new roof and rain gutters. 3/2010: The Church of the Presidents remains closed for restoration. Restoration progress is moving slowly, but the Long Branch Historical Museum Association is working hard, hosting fundraisers and soliciting donations. 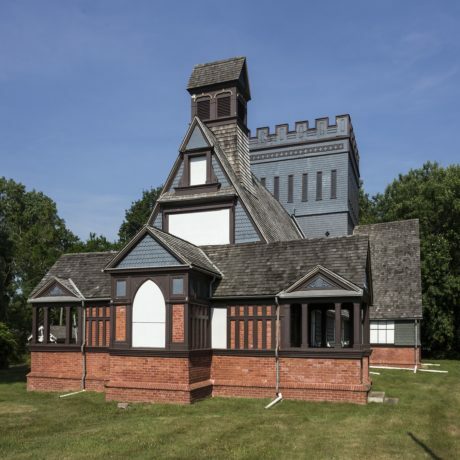 Constructed in 1879, this church is one of the last remaining structures from “The Gilded Age” in which Long Branch was a premier vacation spot for the elite. The most prominent architects of the time were commissioned to design the lavish summer homes, most of which are lost. The name itself gives attest to the seven U.S. Presidents who have visited the church. Acquired in 1953 by the Long Branch Historical Museum Association (LBHMA), the building’s last use was as a small museum of local historical memorabilia and venue space for art shows. Church has been left vacant since 1986. At that time, the building’s stained glass windows were removed and stored.